Why is it that only the Periolase MVP 7 can do LANAP? 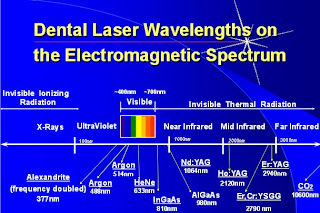 The Electromagnetic spectrum shows the different wavelengths on a graph. Notice the visible spectrum between 400 and 700 nm the periolase is the ND;Yag that is 1064 nm. If a laser dentist says that their laser can do LANAP it kind of like saying Blue is Red or Green is Yellow. Each of these colors has a diferent wavelength and are absorbed diferently in diferent tissues. Thanks for this article about cosmetics. Excellent post. I was checking constantly this weblog and I'm impressed! Thanks for the great information! I remember when my brother had regular check ups with a periodontist in Phoenix because he used to chew tobacco a lot..